KIEV, Ukraine -- With the currency in free-fall and food and fuel skyrocketing, leaders don traditional garb and a brave face. Ukrainian Prime Minister Arseniy Yatsenyuk (L), Ukraine’s Finance Minister Natalie Jaresko (C) and Ukrainian Minister for Economy and Trade Aivaras Abromavicius (R) attend the “Europa-Forum” series of events on April 1, 2015 in Berlin. Natalie Jaresko has the face of a sad magician whose voodoo spells stopped working long time ago’. 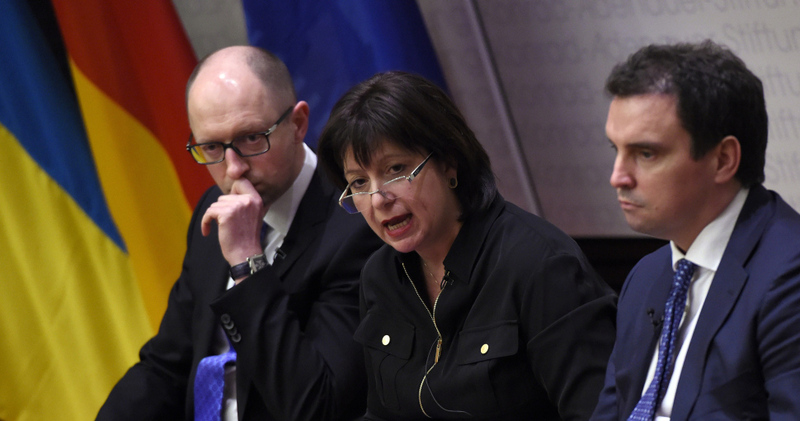 Ukraine's Minister for Finance, Ms. Jaresko nowadays is a common figure on Ukrainian TV. Before becoming the Minister for Finance of Ukraine, this dual Ukrainian-American citizen worked for the US State Department. In the 1990s, she was the first Chief of the Economic Section of the US Embassy in Ukraine, then made her millions as the CEO of a number of investment companies working in Ukraine. Using all her newly acquired Ukrainian vocabulary she is explaining vehemently to her fellow Ukrainians that they should stop worrying about their country’s precarious financial position. On television, she preaches that ‘default’ is not necessarily a bad word after which hunger and cold automatically loom, that there is a silver lining in everything. If it will happen (she admits it’s possible), it will be a “technical” default that won’t cause the national banking system’s collapse. Nobody, not the banks nor their clients, will ever suffer. And of course, by her, the default won’t have any effect on the rate of the national currency hryvnia, which before the latest revolution one-and-a-half years ago was 7-8 to a dollar and now approaches 25 among the street vendors. “In my opinion, according to the economic arithmetic, there should not be any negative impact on the hryvnia. Just arithmetically speaking, money—the currency to be used for the payments—would come out of the country, and in case of the suspension of payments, it remains in the country. Arithmetic is better for the hryvnia,” she says. Of course, $3 billion of it was given by Russia, the enemy that wants to destroy Ukraine both militarily and through financial pressure, but there is another reason for staying positive, which is more nuanced and intricate. So defaulting is not only possible but also would be a just and positive thing to do. This position makes Ms. Jaresko a moderate. There are others, like the leader of the Radical Party Oleh Lyashko that calls on his Government for an explicit default on all international debt. Mr. Lyashko is right that the situation is bad. Ukraine’s external debt, both state and commercial, totaled $125.97 billion or 110.5% of country’s GDP as of April 1, 2015, the National Bank of Ukraine reported. A quarter-century ago, when Ukraine became a sovereign nation, it was $0. Government payments coming due in the course of 12 months are $6.6 billion. Payments on obligations totaled $5.4 billion, including $3 billion owed to Russia—plus interest. Every Ukrainian today—excluding children and the senior citizens—owes the international creditors $3,200, and to pay the amount Ukraine owes to the creditors just this year would mean that every Ukrainian has to contribut’ at least $350, which is two-six months salary. According to the State Statistics Committee, the average monthly salary in Ukraine is around $140 (for simplicity, wages and costs will be in US dollars at the street vendors’ rate of 25 hryvnias per dollar). The most vulnerable are retirees with their monthly pension of $43. The desperate situation of these people is often used by the political parties to organize “performances” in their support. New UKROP party, for example, financed by the oligarch Ihor Kolomoisky, recently organized in the town of Chernihov the rally in its support. To mobilize the senior citizens, free food was promised—one package of flour, one package of noodles and two cans of fish per person. While pushing forward for handouts, the big crowd of desperate retirees burst into a fist-fight. If one believes the Ukrainian newspaper Vesti, which reported the story, in Kharkov region in July two senior citizens—Serhei Rohanin and Vladimir Maryushchenko—committed suicides by hanging themselves after having received the utility bills with new prices. Serhei Rohanin did it in a very unusual way—first, he put on the national dress “vyshyvanka”—a shirt with traditional colorful ornament embroidered around the neck and cuffs, then shouted modern day Ukrainian political and military battle cry of the patriots “Glory to the Ukraine !! !” – and jumped into the noose. US Ambassador to Ukraine Geoffrey Pyatt also wears ‘vyshyvanka’ from time to time to show his country’s support and affection for everything Ukrainian. In the meantime, the monthly minimum wage in Ukraine, which is $48, needs an additional $4 to cover the most basic food basket, leaving aside transport expenses, clothes and the rest. In May 2010, the food basket was 55% of the monthly minimum wage, in May 2015, it was 108 percent. According to Ukrainian State Statistics Office, within last 12 months sunflower oil has risen 200%, fruits 197%, eggs 181%, bread 175%, pasta 171%, fish 171%. But this is not what worries Ukrainian folks – first and foremost they think about their new utility bills. Price for the natural gas has risen 553% since last summer, for electricity 133%, for water 176%. Government reformers promised that it was just the beginning. The definition of middle class in Kiev starts with $400 monthly income, in all other places outside the capital $200 will do the trick. The percentage of middle class in Ukrainian society is the lowest in years—about 9%, according to TNS company. If—or “when” by the pessimists—the dollar hits 30 hryvnias, the middle class of the country will be eliminated. The income level of the Ukrainian so-called well-to-do class can be demonstrated by the salary of the Deputy General Prosecutor of Ukraine Mr. Vitaly Kasko who makes $720 a month, the district prosecutors who work under his command make up to $400. The level of unemployed during the post-revolution period crawled up from 7.7% to 9.6%, but it looks to be heading higher because reformers’policy includes energy parsimony and getting rid of unpromising industries, which are plenty. The reformers’ course of de-industrialization as part of getting rid of country’s “energy dependence” will mean a hard landing for the residents of five Ukrainian cities whose population exceed one million, including Kiev with its 3 million inhabitants. Ukraine, swimming through the ocean of reforms, is in uncharted waters. Other countries that went through the painful period of reforms, the level of urbanization was definitely lower. In Poland, for example, which has about the same number of people as Ukraine, there is only one city with the population over a million – Warsaw with her 1.7 million inhabitants. Just two years ago, under the previous “corrupt regime,” the average salary in Ukraine was $500 a month, average social security check—$200 a month when the prices for goods were less than half what they are today. National currency fell into the abyss from 7-8 hrivnias per dollar to an official 22-23 hryvnias per dollar. The only reason it doesn’t fall even deeper for now is Ukrainian Government’s liabilities for unpaid meager wages reached the unprecedented sum of $72 million, the unpaid wages in private companies cannot be definitely calculated but the number must be humongous. Some Ukrainians, of course, do not care about the money. Flamboyant new Governor of Odessa Region Mr. Saakashvili openly declares that his lavish lifestyle and the ones of his team (in which some are his fellow-Georgians and there is even a young daughter of the former reformist Russian Prime Minister) doesn’t cost Ukraine’s budget a hryvnia—all is paid for by American taxpayers. Minister for Finance of Ukraine, Natalie Jaresko, the one who often goes on TV, says that she sends her kids to the private International School in Kiev on the money she made before in private sector as a head of Horizon Capital Investment Company. Ukrainian President Petro Poroshenko … well, he is a billionaire. The Ukrainian Government blames the situation on war in the east of the country and on corruption of the previous—the word “criminal” is always used— regime. There is a big part of truth in this claim, but also political slyness. Yes, the war takes a heavy toll on Ukraine’s economy but 6 million people who barely survive in the regions under the control of anti-Kiev insurgents haven’t gotten anything from the Kiev government money-wise for more than a year and a half—no salaries, no retirement money, no social security, no benefits of any kind, effectively being cut off from Ukraine’s budget as unnecessary ballast. As far as the “previous corrupt regime” mantra is concerned, the word “previous” holds just a bit of water. Today’s President of Ukraine, oligarch Petro Poroshenko, for one, started his political career in 1998, winning his seat in Supreme Rada, became Secretary for Security and Defense in 2004 (dismissed in 2005 after allegations of corruption) and appointed Chairman of the Parliamentary Committee on Finance and Banking in 2006, head of the Council of the Ukraine National Bank in 2007. In 2012 previous – “corrupt” President Yanukovich appointed Mr. Poroshenko the Economic Development and Trade Minister of Ukraine. Prime-Minister Arseny Yatsenyuk (“our guy Yatz”) was appointed the Minister of Economy of Ukraine in 2005 and a Chairman of the Parliament in 2007. The sad fact is that Ukraine is broke—the National Banks has just a little bit more than $10.264 billion in its coffers. Kiev does not have enough money to prepare for the heating season, which means that most likely people will freeze again this winter. To solve the problem, Ukraine is negotiating with international partners to obtain credit- $1 billion to buy natural gas and $300 million for coal. Righteously shutting the door and throwing away the key from the Russian market for her industries’ products, post-revolution Kiev deliberately closed its eyes to the fact that they have almost nothing to offer to the rest of the world. Europe’s quality standards cannot be matched by Ukrainian industry any time soon. Even Ukrainian white salt is used in Europe only to put on the roads during the winter or in the chemical industry as additive, or to put into the boilers – in European Union countries, vaporized salt is used and Ukraine’s natural salt is considered ‘dirty’ for having too many minerals in it. So, how to come out of the mess the country is in? So far, nobody of the ruling elite has the answer unless one should seriously consider the program of Oleksandr Turchynov, the Secretary of the Council for National Security and Defense of Ukraine and former acting President of Ukraine. He has his own idea on how to improve Ukraine’s disappearing economy. Like everything with a touch of a genius, it’s very simple—Ukraine must sue Russia for the “annexation of Crimea,” which, by Mr. Turchinov’s reckoning, is worth $100 billion. Of course, as a patriot, Mr. Turchinov doesn’t want to sell Crimea to Russia, he wants Ukraine to receive both the coveted peninsula and the coveted cash. Mr. Yatsenyuk, the Prime-Minister, gives Mr. Turchinov’s idea thumbs up and orders his subordinates to sue Russia for hundreds of billions of dollars in all kind of international courts—so far, not a single dollar out of the ocean of greenbacks that would help Ukraine prosper has been received. Meanwhile, the word ‘Greece’ makes him mad. Life is not fair to Mr. Yatsenyuk. Running out of ideas on how to deliver the promised European living standards to his fellow Ukrainians must be disheartening. His depressive—Freud might even say moribund—mood can be perceived in Mr. Yatsenyuk’s constant use of a word ‘kamikaze’ with regard to himself. Yes, there were a lot of promises made. Being a politician, Mrs. Nuland omitted one thing – how many years the healing process is going to take. And no, she did not have a ‘vyshyvanka’ on.